Within JCESR, we have integrated a collection of synthetic and electroanalytical laboratories that, together, create signature research tools for our members. The integration of these labs provides the ability to synthesize model electrode surfaces that are fully characterized chemically, structurally, and electronically, and then transfer these surfaces directly into ultrapure electrochemical environments without exposing the materials to the atmosphere. We pioneer advanced NMR techniques to better understand battery material characteristics. 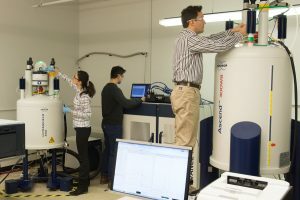 The Electrochemical Discovery Laboratory (EDL) – a key JCESR discovery tool located at Argonne – synthesizes high-quality materials for testing in beyond-lithium-ion batteries and characterizes their properties with state-of-the-art analytical techniques. The EDL facility houses a collection of synthetic and electroanalytical laboratories that, together, create a signature research tool for JCESR researchers. With these labs, it is possible to synthesize liquid electrolytes with unparalleled control over water content and other impurities. Scientists also design and characterize solid materials used in electrochemical applications and measure their electrochemical performance. This is achieved through a combination of synthesis tools, structural probes, surface compositional analysis techniques, and trace liquid impurity analysis capabilities. The integration of these labs provides the ability to synthesize model electrode surfaces that are fully characterized chemically, structurally, and electronically, and then transfer these surfaces directly into ultrapure electrochemical environments without exposing the materials to the atmosphere – a truly unique capability of the EDL. At the EDL, collaborators from Argonne and other JCESR institutions are able to make use of the unique synthesis and characterization capabilities that have been developed. These capabilities also serve as an ideal platform for collaborating with theoretical efforts, where precisely tailored experiments can provide unique inputs into computational models in order to better understand the electrochemical behavior of new battery systems. JCESR researchers performing liquids and solids NMR experiments at Argonne. Nuclear Magnetic Resonance (NMR) – The NMR characterization capabilities in JCESR work synergistically with materials synthesis and design of electroactive materials efforts. We emphasize the development and understanding of cation transport within bulk solids and across electrochemical interfaces. Scientists working in solid state materials use specialized types of NMR methods – high-resolution Magic Angle Spinning (MAS) and electrochemical in-situ NMR – to identify key structure-activity relationships that define material performance characteristics by studying materials complexity and ionic mobility in bulk solids and electrochemical interfaces for new multivalent energy storage chemistries. Novel JCESR work includes pioneering magnesium NMR methodologies in paramagnetic systems to gain an understanding of the local structure changes that occur in new magnesium-ion battery materials. Expertise in in-situ electrochemical NMR methods allows for quantitative investigation of batteries in near-operando conditions. The computational NMR group focuses on characterization of liquid solvation structures and interfaces to enable new non-aqueous multivalent electrolytes. The NMR facilities at Argonne National Laboratory and Pacific Northwest National Laboratory together constitute very low to very high field NMR systems capable of high-resolution liquids and solids measurements with extreme low- to high-temperature windows and environmental control, as well as diffusion capabilities and state-of-the-art high field Dynamic Nuclear Polarization NMR. JCESR continues to apply NMR to its five Thrusts: For example, we use NMR of solvation structures in the Liquid and Solid Solvation Science Thrusts and the Flowable Redoxmer Science Thrust; electrophoretic NMR and Pulse Field Gradient NMR in the Solid Solvation Thrust; computational NMR and Dynamic Nuclear Polarization (DNP) NMR in the Charge Transfer at Dynamic Interfaces Thrust and advanced solid-state NMR methods, in-situ electrochemical NMR, and operando synthesis in the Science of Material Complexity Thrust.